MADISON, Wis. — College Football Playoff rankings or not, the Wisconsin Badgers play with week-to-week blinders. No-nonsense coach Paul Chryst doesn’t get caught up in debates about poll positioning. The collective focus for his team is trained on getting ready for Indiana this weekend, even with the first playoff rankings being released Tuesday night. Wisconsin (8-0, 5-0 Big Ten) is in pretty good shape in the latest AP poll, up one spot to No. 4 after beating Illinois 24-10 last week. But that may not be a forecast for where Wisconsin lands initially in the playoff chase. A schedule without a ranked opponent could factor into the selection committee’s deliberations . The offense has had stretches of inconsistency. Big Ten-leading rusher Jonathan Taylor is the latest addition to a growing injury report. It’s possible that one-loss teams like Notre Dame and Clemson could leapfrog Wisconsin. 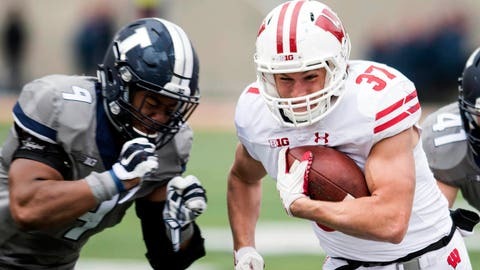 So the final four games of the season — five assuming that the Badgers go to the Big Ten title game — provide an opportunity to shape perceptions as the postseason comes into sharper focus. It’s not Chryst’s style, though, to look too far ahead. He has his players well-schooled in following a “next-game-only” mentality. A tough-as-nails defense is allowing just 12.9 points and 268.0 yards per game, each good for fifth best in the FBS. The D has helped clean up for some offensive mistakes, allowing opponents to convert just 5 of 14 opportunities following a Badgers turnover into points. Defense is part of the Badgers’ bedrock. The running game remains a Wisconsin staple, too. But the Badgers may have to adjust if Taylor misses the Indiana game with a left leg injury. The star freshman didn’t play in the second half of the victory over the Illini . The Badgers still have options with sophomore Bradrick Shaw, who lost his starting job to Taylor earlier this year, and another emerging freshman, Garrett Groshek. “We’ve got to be a little sharper, we’ve got to make sure the holes are there, so we can make it a go no matter who’s running the ball,” left tackle Michael Deiter said. Offensive inconsistency has been Wisconsin’s biggest hurdle. Quarterback Alex Hornibrook is second in the Big Ten in pass efficiency rating (158.8). He has played well in the red zone, but has thrown seven of his eight interceptions this year in conference play. Already without senior wideout Jazz Peavy (right leg), the Badgers could also be without leading receiver Quintez Cephus against Indiana because of a head injury. Playmaking freshman wideout Danny Davis, who has missed the last two games with a left leg injury, remains questionable. Chryst said injured players went through the team’s walkthrough on Monday, though their availability for the Hoosiers will depend on practice the rest of the week. Wisconsin still remains firmly in control in the Big Ten West division with a two-game lead over second-place Nebraska and Northwestern with four conference games left to play. And the Badgers already hold the tiebreaker after having beaten the Cornhuskers and Wildcats earlier this season.